Are You Comfortable Knowing You’re in God’s Hands? 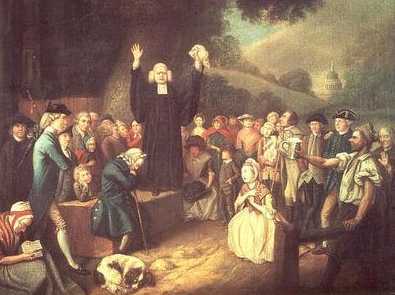 George Whitefield preaching in the open air. Within 100 years after the Pilgrims and the Puritans came to the New World and established their colonies at Plymouth and Massachusetts Bay, the spiritual condition in the American Colonies had fallen into a state of decline and lukewarmness. Several social and economic factors contributed to this. During the early 1700’s, the population and diversity of people and religion in the colonies was growing rapidly. As colonies became more populated, families began to settle further from the center of the community. As a result of this, church attendance and membership decreased due to distance. Families living in more isolated wilderness areas in the west developed a spirit of independence and self-sufficiency, and their dependence on church and civil government lessened. As efforts were focused on physical survival, attention to spiritual matters seemed less important, while on the other hand, an interest in materialism was on the rise. But towards the middle of the century God brought about a spiritual revival in New England known as The Great Awakening, an event that proved to actually be a key factor in uniting the colonies leading up to the Revolution. George Whitefield and Jonathan Edwards are the two preachers most closely connected with and responsible for The Great Awakening in the 1730s. Unlike the typical Puritan minister, Whitefield was an emotional, fiery Anglican who scolded other preachers for being cold and dead. He began preaching in open fields when he was barred from many church pulpits. As an itinerant evangelist, George Whitefield traveled to outlying communities to bring them the Word of God. 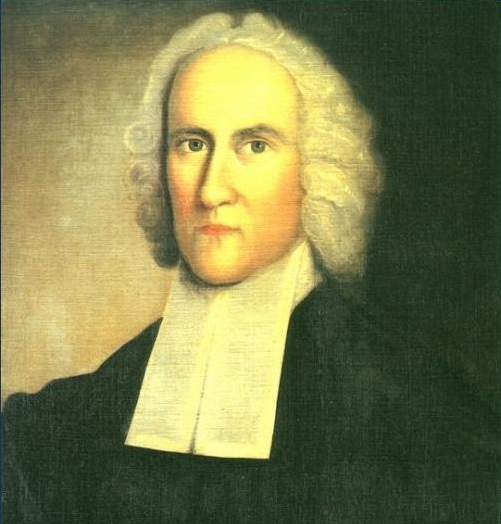 When he arrived in Connecticut, Jonathan Edwards welcomed Whitefield to preach in his church. Unlike Whitefield, Edwards did not speak with great emotion. He didn’t use a loud voice or dramatic gestures, but he did use sensory imagery, very visual metaphors to appeal to the listeners’ emotions. Edwards preached his famous sermon, “Sinners in the Hands of an Angry God,” on July 8, 1741 at Enfield, Connecticut. The sermon followed the typical format used by Puritan preachers of the day: the presenting of a statement or verse from Scripture, followed by logical arguments with enumerated points and examples to support them, and ending with practical applications to the listeners. Edwards’ sermon was based on the phrase, “Their foot shall slide in due time” (Deut. 32:35). The wicked can slip at any moment, and it is by the weight of their own sin that they will slip. It is God who is keeping them from slipping, until their appointed time. God can easily cast his enemies into hell. They rightly deserve to be cast into hell, and have already been condemned. The only reason sinners aren’t more wicked than they are is that God’s hand restrains them. Neither the wisdom, will, nor efforts of a sinner can help him escape from hell. There are many ways God uses to take the wicked which cannot be known to man. God is not obligated to save anyone. Hell’s mouth is open wide, ready to swallow the wicked. Lost men “walk over the pit of hell on a rotten covering” which has many unseen weak spots in it. Like a spider, they hang by a slender thread over flames which may singe it at any moment. The wrath of God is like great waters, which rise higher and higher, and nothing but the mere pleasure of God holds them back. He also uses undeniable facts of life: people die everyday without warning, even young people die; death can come at any moment and there’s nothing anyone can do to stop it. Finally, to his emotional and logical pleas Edwards inserts a sense of urgency by suggesting that time and opportunity are limited. The use of terms such as “at any moment,” and “suddenly” contribute to this effect. He reminds us that every man is at each moment on the “very brink of eternity,” that destruction often comes suddenly and without warning, and that some present may be in hell “before the year is out” or even by tomorrow morning. By way of application, Edwards ends his sermon with a call to repentance. Although Edwards believed in the doctrine of Unconditional Election, he also believed in the free offer of the Gospel. The purpose of his address was to awaken the lost to their impending doom and convince them to repent. He directs this call to young and old, men and women alike, and reminds them that “in the land of the living, blessed with Bibles, and Sabbaths, and ministers,” all are without excuse. He warns them that there are many in hell now who deserve it less than you, and who wish they had the opportunity you now have. And now you have an extraordinary opportunity, a day wherein Christ has thrown the door of mercy wide open, and stands calling, and crying with a loud voice to poor sinners, a day wherein many are flocking to him, and pressing into the kingdom of God…Are not your souls as precious as the souls of those who are flocking from day to day to Christ? We went over to Enfield where we met dear Mr. Edwards of Northampton, who preached a most awakening sermon…and before [it] was done, there was a great moaning and crying out through the whole House: “What shall I do to be Saved?” – “Oh, I am going to Hell” – “What shall I do for Christ?”, etc. The minister was obliged to desist – the shrieks and cries were piercing and amazing. After some time of waiting the Congregation were still so that a prayer was made by Mr. [Wheelock] and after that we descended from the pulpit and discoursed with the people, some in one place and some in another, and amazing and astonishing the power of God was seen. Several Souls were hopefully wrought upon that night. And oh the cheerfulness and pleasantness of their countenances that received comfort; oh that God would strengthen and confirm. Even as a Christian, I felt scared a lot by this sermon – but I urge you, listen to all of it. This sermon describes how powerful God is and exactly why we need to fear him. I must admit, I did not have a true fear for God before I listened to this sermon, and now I can understand exactly why. I tell you the truth, I am shaking and crying now, but rightfully so, because God has revealed to me, how powerful he is. We all need to fear God. The time to act is NOW! Don’t miss the opportunity that God is giving you. Everyone, Christian or Non-Christian should listen to this sermon. I highly recommend it. I recommend not only reading the sermon, but listening to it on audio. “Sinners in the Hands of an Angry God” is an important work for its historical significance and its literary merit. I think it should be included in every high school American Literature course. More important, however, is its theological value. Edwards’ sermon rightly highlights the holiness of God and the sinfulness of man, putting man’s relationship to his Creator and Judge in proper perspective. It reminds us that we have reason to “fear Him who is able to destroy both soul and body in hell” (Matt. 10:28). I believe every Christian should be familiar with it and have copies available to give to their lost family and friends to read. If more preachers would be faithful in preaching the full counsel of God’s Word and boldly present an accurate picture of God and sin before the people, rather than avoiding uncomfortable or “offensive” portions of scripture and presenting a caricature of God which is an image of their own making, I believe we would see more true and lasting conversions in this land. May the Lord bring spiritual revival once again! Note: This title is included on my list of non-fiction works I believe every Christian should read. This entry was posted in Christian Books, Non-Fiction and tagged eternal judgment, foot shall slide in due time, George Whitefield, Great Awakening, Jonathan Edwards, Puritans, repentance, Sinners in the Hands of an Angry God. Bookmark the permalink. 4 Responses to Are You Comfortable Knowing You’re in God’s Hands? Great summary of a great sermon. This sermon by Edwards was used mightily by God in the 1st Great Awakening. It is a classic puritan message. The listener is told of his precarious position in sin before a holy God. Then the gospel call is given. If only modern pulpits would give up on ‘God loves you and has a wonderful plan for you’ and would return to true gospel preaching. You got that right! A person needs to be aware he is in danger before he will call out for help. Yes it’s true that every sinner has offended a holy God, but the Good News of the Gospel is that, God Saves Sinners!